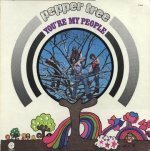 The Pepper Tree was the culmination of a handful of bar bands in Nova Scotia, formed when drummer Tim Garagan left his band Friends of The Family and got together with guitarist Ritchie Richmond and Lenny Brennan on bass when those two left their previous group Lost Children in '67. They soon augmented their sound with Tony Argent as a second guitarist, ex of The Outcasts. To set themselves apart from the rest they then persuaded friend Bonnie Oulton to take on lead vocal duties. Beginning with their first show in Hubbards, NS, they honed their chops playing the bars and continued to refine and diversify their sound when Argent was replaced by keyboardist Bob Quinn and Doug Billard, ex of Central Nervous System replaced Oulton on vocals in mid '68. Developing an acid/psychadelic meets Partridge Family sound unique to the area, they were noticed one night by a talent scout who recommended they cut a demo and send it to Capitol Records. The basement tape impressed Capitol's Wayne Paton enough he signed them to a deal in '69 and took them to Toronto's Nimbus 9 Studios to work with Jack Richardson (Alice Cooper, Bob Seger, Guess Who). Capitol only wanted original material, and they came out with "Everywhere," backed with "Mr Pride," both written by Garagan. Next up was "Shine Light Shine" and its b-side "Hometown Girl." Though neither single was a 'smash hit', both charted and impressed label execs enough they encouraged the band to move to Toronto, closer to the studios and closer to the obviously huger potential market. But some members were unwilling to make the move, and the band was basically reinvented, as Billard, Brennan and Richmond all stayed home. Jim White, ex of Axis, who Billard had played with back home on the coast with both Central Nervous System and Five Sounds was friends with Garagan and Quinn and was now living in Toronto as well. He agreed to be the new guitarist. And after Cornerbrook, NFLD native Chris Brockway answered an ad to fill in the bass position, the next phase of the band was set. With Capitol confident enough in the band's ability, Garagan took on the lead vocal chores, and they made their mark on the Ontario circuit and moved to Alliston, ON in 1970. Paton convinced them to drop 'The' from their name, and they began writing material for an album and brought back Jack Richardson when they went into RCA's Toronto studios. YOU'RE MY PEOPLE was released the next summer, which ran the gamut of psychadelic and pop sounds. Garagan was the chief songwriter, contributing on or writing himself all but Quinn's "How Many Times." The album featured the nearly six-minute live favourite "Airplane" - complete with an organ solo, and the album's two singles, "Try" and the title track, with its melancholy "From A Candle" as the b-side. The album was released Stateside in the spring of '71, after White left the group. American copies actually mistakenly credited new guitarist Joel Zemel, a Halifax native, as the guitarist. Not totally satisfied with the band, Capitol urged the band to pick up a new frontman, and Matt Minglewood, formerly of Universal Power and a fellow Maritimer was brought in on guitars and lead vocalist. But his tenure was short, and left to form Cold Duck before year's end. His replacement, Terry Hatty, also had a short stay in the band and was also gone after only a few months, putting Garagan back again as lead vocalist. They released "Love Is A Railroad," a Quinn composition as a single, which actually featured the already departed Zemel on guitars. The band continued to find east coast'ers, as they picked up Halifax's Rick Edgett as his replacement, though he was replaced before long by Paul Butler. The band continued on the circuit, playing mostly eastern Canada dates but ventured into the US as well. They continued to try experimenting with their sound while maintaining their identity. With Paul White producing, they cut "Midnight Lady," "Teach Me How To Fly," "Put A Smile On Your Face" and "Funky Music" as singles all by the summer of '72, none of which lived up to label execs expectations. The revolving door continued to spin, and founders Garagan and Quinn were both gone by the spring of '73. Brockway brought in Brian Too Loud Macleod as the new drummer, who'd previously played with Garrison Hill, and Ralph Parker to replace Quinn on keyboards. Now there were not only no original members left, but the band had lost its Nova Scoitian identity entirely, as Brockway, Parker, Macleod and Butler were all Newfoundlanders. The band toiled away for the remainder of the year after being dropped by Capitol, but packed it in by the spring of '74. The lineup featuring Tim Garagan, Zemel, White and Brockway enjoyed a few shows and a few beers during a brief reunion in '91, two decades after their album's release. Garagan and Quinn both joined Molly Oliver a couple years after originally leaving Pepper Tree and moved back to Nova Scotia. After that band's demise in the mid 70's, Quinn became a songwriter for the likes of Roger Whittaker before forming Quincepts Productions Ltd, while Garagan became a session musician, as did Richmond before becoming an ordained minister. Brockway went on to play with Rhinegold, which also featured Lawrence Gowan, Brutus for a short time, then an early version of Wrabit, Hanover Fist and Lee Aaron. White and Argent's paths would cross again shortly after the band's demise, forming Snakeye and releasing one lp in '75. Hatty formed Ram, another short-lived east coast band with only one lp under its belt. Billard went on to a moderately successful, albeit short solo career, charting with the single "I've Lost My Place" in '75 with United Artists. Zemel and Edgett still have on again, off again projects, and Macleod went on to tour with Edward Bear before playing with Chilliwack and then forming The Headpins. He went on to become a Juno Award-winning producer before succumbing to cancer in 1992.